Please see the following discounts our members get. It's easy, just become a member by signing up, and get your discount today. Membership starts at Bronze level, Silver members get more discounts, and Gold membership gives the biggest savings. Just sign up as a member below, and your 10% discount code will be emailed to you instantly, to use in our shopping cart. We will only contact you with promotions and news. Exclusive pre sales offers and promotions, not available to the public. Sign up as a new member (bronze), and get a 10% discount on your first order. Order must be €30 or more. Get promoted to Silver Membership (once you have purchased 3 frames) and get a 15% discount on your next order, (if you refer a friend, and they purchase a frame). 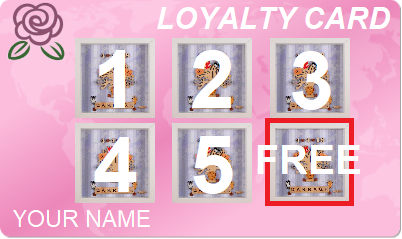 FREE card with every frame purchased. Get promoted to Silver Membership (once you have purchased 3 frames) and get a free occasion card with every frame you purchase. Get promoted to Gold Membership (once you have purchased 5 frames) and get a 20% discount on your next order, (if you refer a friend, and they purchase a frame). Purchase 5 frames and get your 6th frame absolutely free (you just pay for shipping if required).